When it comes time to put your watch back together after removing a damaged or broken tension fit watch crystal, you will find that a watch crystal press is an indispensable aide. 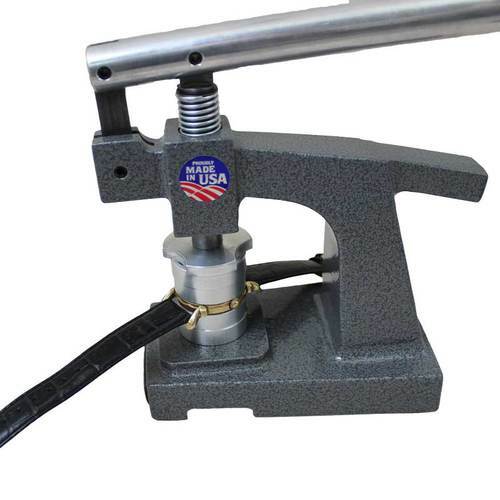 Learn how to use a crystal press to fit a tension ring crystal with this guide. Before you can fit a new crystal to your watch case, you need to open the watch case and remove all the important parts of the movement to avoid damaging them and then measure the case to ensure that you have the right size replacement crystal. Once you have removed the inner workings of the watch, and you have your new watch crystal in hand you will need to choose the watch press dies that fit the watch case appropriately to insert the crystal. Start by fitting one straight walled die to the back of your watch case – the part that usually sits against your wrist. The edges of the die should fit around the outer edges of the watch case without pressing on the watch lugs as it could bend and damage them. Once you have the correct size die for the back of your watch case, insert it into the watch crystal press on the bottom post that sticks up from the base. Next, you will need to find the die that will fit the new watch crystal. You want to find the die with the angled inner walls that rest on the outer edges of the loose crystal like this. Holding the watch crystal in one hand, start fitting watch dies to it until you find the one that covers the crystal with the angled inner walls positioned to apply pressure to the outside edges of crystal. Position this second die in the watch crystal press on the top post of the press that faces down toward the other die you have already placed. 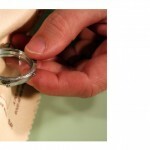 Take your selvyt cloth and place it across the lower die to protect the back of the watch case from being scratched by the die. Place the watch case on the cloth covered lower die in the jaws of the watch case press with the top of the case facing up. Then, take your loose new crystal and position it over the opening in the top of the watch case so the pressure will push the crystal in the watch bezel to give it a tight and waterproof seal. Double check that the watch is positioned perfectly under the dies. 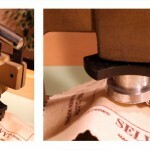 Loosely close the jaws of the press to ensure the correct positioning. Grip the handle of the crystal press and slowly squeeze down bringing the two dies together. Apply a gentle amount of pressure until you hear the crystal click into place. If the crystal doesn’t slip into place quickly, check the crystal to be sure hasn’t been damaged before adding a little more pressure to it. 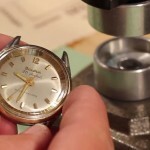 Repeat this process, until you find the right amount of pressure to press the crystal into the watch case. Once the crystal and bezel are in place, you can put your watch movement back together and then continue wearing your watch again. To learn how to install other types of watch crystals into a watch case, check out the rest of our Learning Center.